Glenn invited everybody up to Zion for his birthday from March 1-3, 2008. I drove up with Ryan, Danny and Erin, and we got ourselves to the cabins of the Zion Mountain Ranch, which is just outside of the park’s east entrance. They have buffalo there, which was really pretty cool. We played games both that first night and the next night, and during the days most of us went and played outdoors a bit. The next day, all of us except Keith went into the park to do a hike. It was decided that we were going to do the hike to Observation Point, which is an 8 mi RT walk, with ~2150′ of gain. 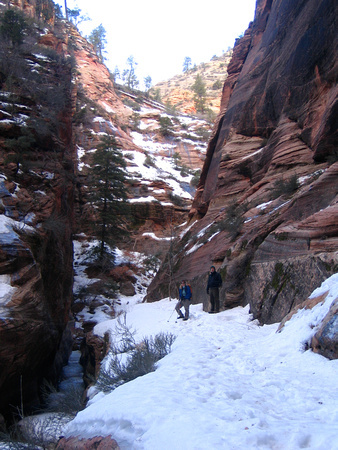 The trailhead for this hike is shared with the Weeping Rock trail, and had warnings that it might be icy. We took a photo with the sign, since it was pleasant, if cool, on the canyon bottom, and only scattered snow patches around. We were wrong. Oops. Really, the trail looked fine when we started! Famous last words, I know. Anyway, we headed on up the first set of switchbacks, and it readily became apparent that even though there wasn’t a lot of snow on the ground, almost everywhere that it had stayed was, of course, on the trail, and it got nice and compacted into ice. The white line is the trail. Eit. Anyway, we were just careful over these section, and had some really great views. 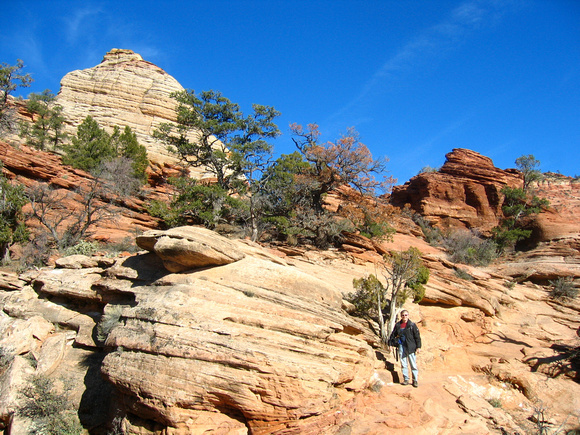 After a short while, the trail makes an abrupt right turn into a canyon. It was incredibly gorgeous, but was really very snowy in there where there was basically no sun. The canyon continues along, and we enjoyed looking at the water and the snow and the sun, and then we followed the canyon along to the left, and through a more close in area, and then suddenly exit into a much more open area, very bright and sunny and no snow. It was like walking into an entirely different season. Walking further along, we zig-zagged up another set of trails, just enjoying what we saw, until we got to a trail junction, from which we turned up towards the top of observation point. This trail travelled it’s way up the side of a large rock face, and finally put us out on the top of the feature. From up there, which was a fair bit more snowy, we made our way along the length of the top until we got to the point itself. From up there, the view was magnificent, and it was pretty amusing to be looking *down* on Angel’s Landing that I had just climbed a few months before. We hung out for a bit, took some pictures, and came back down the way we came up. Unfortunately, we stayed out a bit longer than we had planned given the length of the drive to get to where we were, so we were maybe about 45 minutes or an hour late getting back to where our friends were with the horses. That made me feel pretty terrible , given my hangups about punctuality. The next day a bunch of people went on a horseback ride. 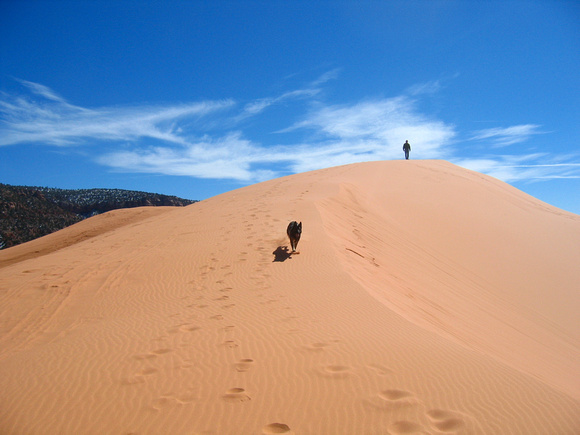 Those of us not wanting to shell out the monies for this instead took a bit of a trip over to the Coral Pink Sand Dunes State Park – just a hop skip and a jump away from Colorado City, Warren Jeffs’ fun little party town. Anyway. There are sand dunes! They are, in fact, pinkish/orangish. It’s pretty awesome. The weather started out a bit cool as we walked in a loop along a nature trail and read the signs about the local area. Then , following Erin’s lead, Seth and I took off to climb one of the actual dunes. 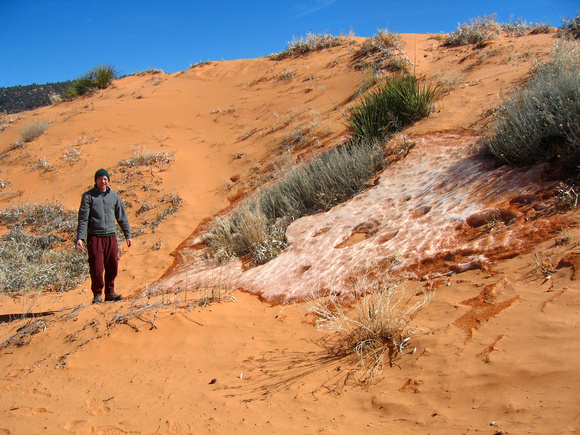 We passed a tiny bit of snow, and had a nice walk up the largest dune we could see. Anyways, at that point, we basically packed up and headed out, on our way home. However, Ryan , Danny, Erin, and I took the opportunity as we were driving back through Zion to stop at a short trailhead on the east side of the park that led to the Canyon Overlook. 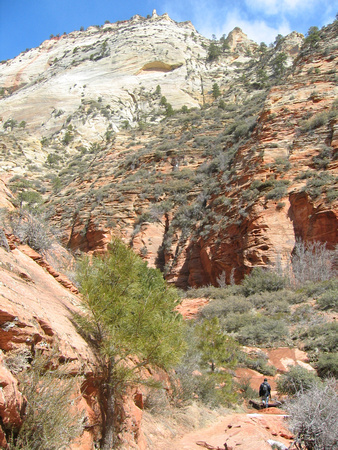 This bit of trail is just east of the long tunnel separating the canyon and the upper eastern part of the park. 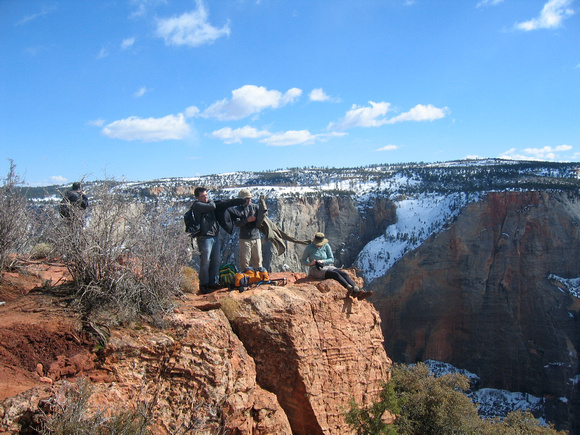 It leads you out to a pretty spectacular view over Zion Canyon and part of another canyon. It was actually a fun little walk, with some really cool rock overhangs, rocky bits, ledges, and so on. Someone actually turned back at one point where you had to walk along a bit of a bridge next to an overhang – not the most frightening place, I have to admit, but, whatever makes them feel comfortable.